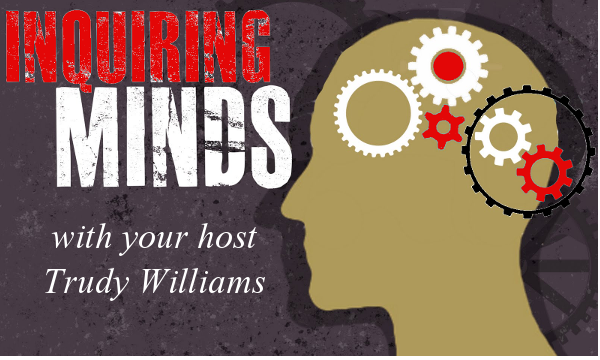 Inquiring Minds is a locally produced issues and interest show hosted by Trudy Williams. Some of the previous guest include Mariposa County Supervisor Rosemarie Smallcombe, Mariposa County District Attorney Tom Cooke, local author and visionary George Catlin, local author, poet and retired psychologist Rachel Oliver, National Wildlife Federation California Executive Director Beth Pratt-Bergstrom to name a few. Join Trudy Williams every Sunday at 2 pm and every Tuesday at 6:30 pm for local interviews and discussion on issues and topics of the day. Trudy Williams interviews Artist/Sculptor/Educator and the areas "Mountain McGyver" Donovan Peterson about the Trans-formative Power of Art. Listen to Donovan as he tells about his experiences teaching art at a Women's Prison and how it helped to not only rehabilitate but transform the lives of these women. Tune in Tuesday December 19th at 6:30 pm and Sunday the 24th at 2:00 pm.